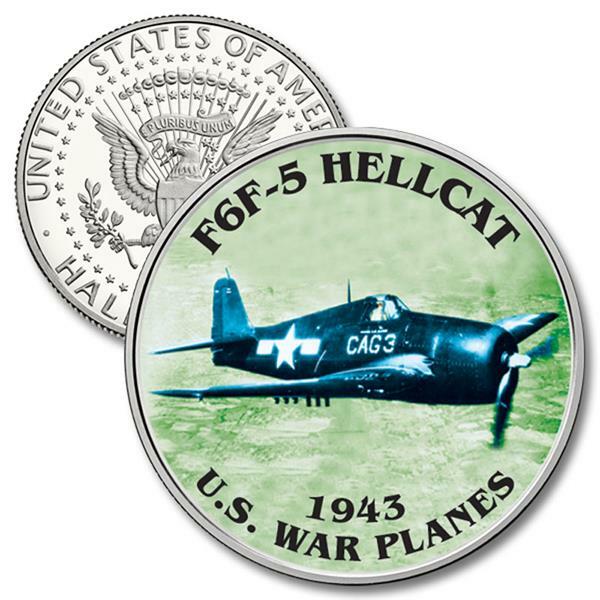 Exclusive F6F Hellcat Coin – Yours For Just $9.99! Now you can own an authentic U.S. Half-Dollar enhanced by Mystic with an image of one of the most famous war planes in American history – the F6F Hellcat. For just $9.99, this coin will give you a glimpse of the plane's history. It's fun to imagine what important missions this plane might have gone on during its time... Grumman Aircraft made the F6F Hellcat fighter to engage the enemy in the Pacific Theater during World War II. The basic Grumman design philosophy was "Make it strong, make it work, and make it simple," and that's just what they did when they made the Hellcat. It could out-climb, out-dive, and out-run the famous Japanese Zero fighter. Heavily armored, it could absorb a lot of damage and still keep flying. One Hellcat ace pilot joked, "If they could cook, I'd marry one!" Between September 1942 and November 1945, Grumman delivered 12,275 Hellcats to the U.S. Navy. At their peak, the company produced 20 fighters a day. F6F Hellcats defended the Pacific fleet and supported Marine strike forces. During their time in service they shot down approximately 5,000 Japanese planes and lost just 270 of their own in combat. Grumman Aircraft made the F6F Hellcat fighter to engage the enemy in the Pacific Theater during World War II. The basic Grumman design philosophy was "Make it strong, make it work, and make it simple," and that's just what they did when they made the Hellcat. It could out-climb, out-dive, and out-run the famous Japanese Zero fighter. Heavily armored, it could absorb a lot of damage and still keep flying. One Hellcat ace pilot joked, "If they could cook, I'd marry one!" Between September 1942 and November 1945, Grumman delivered 12,275 Hellcats to the U.S. Navy. At their peak, the company produced 20 fighters a day. F6F Hellcats defended the Pacific fleet and supported Marine strike forces. During their time in service they shot down approximately 5,000 Japanese planes and lost just 270 of their own in combat.